I need to start with a recap of the fantastic night we had at our warehouse this past Saturday. We hosted a "Dishing Up Toronto" event for the Toronto Ward Museum. 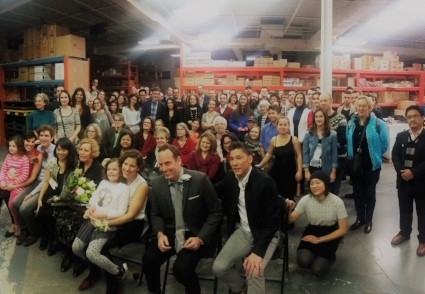 On the eve of our 100th anniversary, over 100 people joined us for food and drinks, while my mom and grandmother told stories about the history of Pasquale Brothers. We had four generations of our family in attendance. A truly magical evening! Thanks to the many organizers, sponsors, volunteers, family members and guests who came out to celebrate with us. It's not a coincidence that many of our holiday favourites come from longstanding family companies. Our Italian Confetti come from Pellino, the oldest candy factory in Sulmona, Italy, started in 1783. The sugar coated, almond candies are still made by hand, over 4 days, using the same 300 year old recipe. Our Bonci Panbriacone are made by the third generation of the Bonci family at the Pasticceria Bonci in Montevarchi, a Tuscan town in Italy. Panbriacone roughly translates to drunken bread. It is a panettone that has been soaked in alcohol - a wickedly delicious cake. Our Panforte come from Masoni, a bakery that was started in 1885 and is run by descendants of the original family. Panforte are a Christmas treat made in Siena, Italy. The traditional variety is made with almonds and honey. We import Spanish Turron and chocolates from Manuel Segura, one of the oldest bakeries in Spain. When it was started in 1874, Manuel Segura would make his sweets on the second floor of his shop, while his wife would sell them downstairs on the ground floor. In the afternoon, he would sell his sweets in nearby villages, with the help of a donkey. The company is now run by the sixth generation of the original family: all pastry chefs, and all named Manuel Segura. We are literally knee deep in baskets this week. With our Ward Museum event behind us, we've quickly filled our warehouse with pre-ordered gift baskets. We have a selection of ready-made baskets in the store or if you call ahead, we're happy to make a basket or gift bag to suit your taste. Please join us for our open houses in our warehouse on the next two Saturdays in December (10th & 17th) from 10 am to 4pm. We will be sampling a variety of products, including some of our holiday specialties.